Grade 1 runner-up Matilda Czech will is one of four outstanding fillies set to face off in Friday's $15,000 Girl Secrets Handicap at Los Alamitos Race Course. LOS ALAMITOS, CA—SEPTEMBER 13, 2018—All eight of the sophomore fillies racing in Friday's $15,000 Girl Secrets Handicap have previous stakes racing experience at Los Alamitos Race Course. Matilda Czech, Remember To Dash, and SC Vapor Trail, for example, competed in Grade 1 million dollar futurities last year, while Splendid Cause won the consolation stakes of the Golden State Million Futurity and captured her trial to the Grade 1 Ruidoso Derby earlier this year. Those four standouts plus four other fillies will get together in the 300-yard dash, which is scheduled as the eighth and final race on the card. First post is 7 p.m.
EG High Desert Farms' Matilda Czech, who finished only a nose behind champion J Fire Up in the Golden State Million last year, will be making her first starting since a troubled fifth in a trial to the La Primera Del Ano Derby on March 10. She's since posted a pair of works, most recently a solid :17.80 drill from the gate at 350 yards. Cruz Mendez will ride for trainer Jesus Nunez. Her career earnings of $325,282 tops this field. EG High Desert will also be represented by Remember To Dash, who qualified to the Ed Burke Million and Golden State Million futurities last year. To be ridden by Erasmo Gasca, Remember To Dash's last start was a third place finish against allowance foes back in March. Similarly to Matilda Czech, the First Down Dash filly worked 350 yards in :18.50 on August 28. Reliance Ranches' SC Vapor Trail is the other filly in this race with over $100,000 in career earnings. A three-time winner at Los Alamitos, SC Vapor Trail enters after posting a seventh place finish in the Grade 2 Golden State Derby on August 15. The quickness she's displaying in many of her previous starts makes her one to watch in this 300-yard dash. Leading rider Jesus Rios Ayala will ride the Corona Cartel filly for trainer Mike Robbins. Kelly, Yearsley, and Yother's Splendid Cause returns to Los Alamitos after two excellent outings at Ruidoso Downs. In addition to winning her derby trial, she ran third to Grade 1 winner Uptown Dynasty in the Corona Cartel Stakes. Splendid Cause has had success here as well, winning the Golden State consolation and qualifying to the La Primera Del Ano Derby earlier this year. She ran second to eventual Governor's Cup Derby winner Black Fryday in an allowance race on May 4. Ed Allred owned the multiple stakes winner Girl Secrets and will now be represented by Better Than Ever is this race. The Kiddy Up filly has finished in the money in all but one of her eight career starts. Vinnie Bednar will pilot the recent allowance winner from post six. Los Alamitos Maiden Stakes winner Missmerizing, Grade 2 finalist Yashira Vista, and local allowance winner Madam Of Fire MV will complete the field. The featured race is named in honor of Girl Secrets, a multiple graded stakes winning filly at Los Alamitos. Owned and bred by Ed Allred, Girl Secrets won seven of 25 starts and earned $177,552 while racing from 1997 thru 1999. Girl Secret enjoyed a tremendous sophomore campaign in ‘98, winning three derbies headed by the Grade 1 Golden State Derby. Trained by Kelly Lewis, Girl Secrets beat the millionaire champion Corona Cash by a length to win the Golden State Derby. 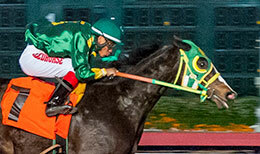 Girl Secrets also scored wins in the Grade 2 La Primera Del Ano Derby and the Grade 2 California Sires Cup Derby. Her sophomore campaign also included a second place finish in the Grade 1 Southern California Derby and she also competed in the Grade 1 Los Alamitos Derby. Sired by Raise A Secret, Girl Secrets was a major stakes qualifier during her freshman campaign. She made the finals of both the Grade 1 Ed Burke Memorial Futurity and the Restricted Grade 1 Governor's Cup Futurity. Girl Secrets made three other major stakes appearances during her 4-year-old season. As a broodmare, Girl Secrets produced the stakes winner Secret Path and stakes finalists Hot Shot and Fire Cliff. She's the granddam of Grade 1 Charger Bar Handicap winner Kiddy Up Cowgirl. Girl Secrets is the sister of Grade 3 winner 3 Bridlewood, stakes winner Citation Five, and stakes finalist Timothy Pilot.